They’re whiteboards! I bought them a zillion years ago from a website called markerboardseconds.com or something like that. Discounted for scratch-and-dent, and man, what a great purchase that has turned out to be. 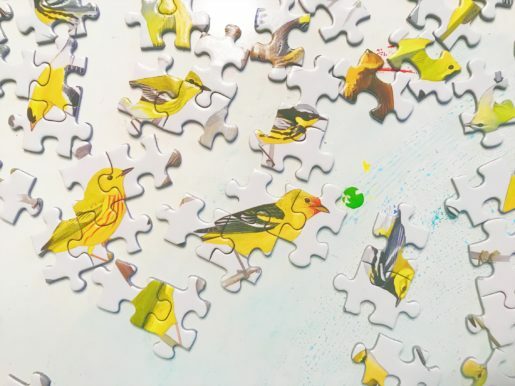 What you’re seeing in the pic above is the backside, which we use constantly for puzzles–that little card table is right next to the big dinner table, so we need to be able to lay out our pieces and move them off the big table when it’s time to eat. The other side is the whiteboard surface. 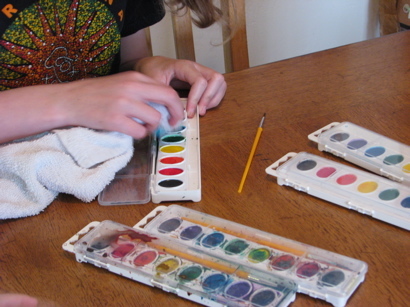 We use some for homeschooly things, but mostly under watercolor paintings. Again, it’s nice to be able to move the wet paintings off the table to dry. They’re coated with years of spatter at this point. That old markerboard seconds site seems to have disappeared, but you can find something similar (albeit considerably pricier) at Waldorf suppliers like Lyra, where they are sold as painting boards. And I’ve seen plain brown ones (no whiteboard side) at art supply shops. When I mentioned in yesterday’s post a topic idea about our best homeschooling purchases ever, these markerboards are what sparked the idea. We use them constantly, daily. The U.S. Presidents are listed on the back of one of them—probably permanent now since I think we wrote them out at least five years ago. And there’s a House of Stuart (or Tudor? both, probably) family tree stained into one of them. And then years and years of watercolor backsplash, as you can see in the top photo here. 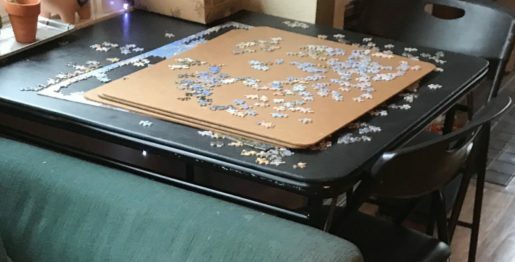 If you need to move a bunch of wet paintings off the dinner table, you can stack the boards up with Legos or blocks to create space between each tier. I have loved watching your journey of learning to sketch and draw. I want to start myself but I’m nervous. Have you always been a person who doodled etc? Or did it start when you made it a goal to sketch everyday? Seeing if there is hope for a person like me who has never done it naturally but has always been inspired by others. I answered with a long reply, which I’ve decided to pull into its own post here. Tl:dr version: If I can do it, anyone can. Hanni, start, start!!! I wasn’t a doodler before…I used to try to draw as a kid and was always so frustrated by my inability to make anything look the way I wanted it to. In college I took a costume design course that included a brief unit on Drawing on the Right Side of the Brain. That book blew me away. And in doing those exercises in class, I was astonished at how much better I got, and how rapidly. But then I dropped it again…for over 20 years. 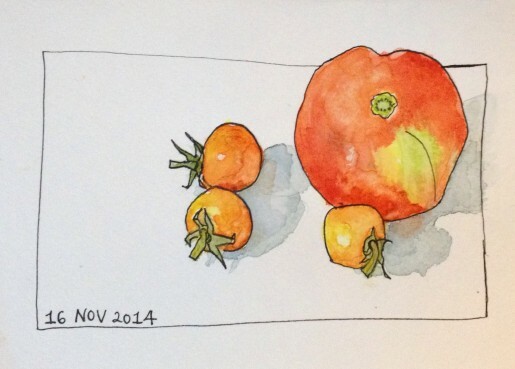 I started this daily practice with Lisa Congdon’s line drawing class at Creativebug in fall 2014. From there I jumped to Sketchbook Skool and was really inspired and energized by those classes. Or—I guess actually I started with a Creativebug class on art journaling with Dawn DeVries Sokol* before the Congdon line drawing class, and I liked that one but found that what I really wanted was to learn to draw (vs art journaling which I always admire when I see other people’s but don’t seem drawn to in my own practice). For dipping your toes in without spending money, I would recommend trying out some of Koosje Koene’s free “Draw Tip Tuesday” videos on Youtube. So good and totally doable. Search YT for them and then maybe scroll back to some earlier ones and work forward. You’ll see that a lot of the stuff in my sketchbook comes from Koosje’s lessons. Jane LaFazio, Liz Steel, and Roz Stendahl. I encountered them all via Sketchbook Skool first. Then Jane came to San Diego for a one-day workshop version of the nature journaling/watercoloring class she offers online, so I signed up for that. And oh my! So awesome. Here’s a post with some photos of the work I did in that class. Liz and Roz are both gifted instructors. Their online classes are video-based and include extremely detailed PDF handouts to download. Backing up to your question: Honestly, I don’t have natural drawing talent. I think in words, not pictures, and I can’t just sit down and draw something out of my head and have the angles and shapes look right. I’m frustrated a LOT of the time by my shortcomings. But natural drawing talent isn’t required to be able to *learn* to draw. If you can sign your name, you can already make all the basic shapes that every single drawing is composed of. That was one of the Drawing on the Right Side of the Brain revelations that floored me, way back when. Anyone can learn. Danny Gregory (the other co-founder of Sketchbook Skool along with Koosje) makes a distinction between small-a art (which we can all make) and capital-A Art (you know, museum stuff). 😉 I’m not striving for Art, just art. My sketchbook journey has made me really happy. About every ten pages I draw something I actually like. 🙂 And you know what, for now that’s plenty. I usually mess up the page with something else, but sketching is something I do that truly is about process, not product. The pens and paints feel so good in my hand. Mark-making, color-swirling—it’s incredibly satisfying. And I like having this thing I do that is purely about personal satisfaction. Writing is the Thing I have always done, the Thing that defines me—and because I’m good at it, it’s the Thing I do for a living. Which…puts you in a different relationship with the Thing. If that makes sense. Sketching owes me nothing, and I owe it nothing. No demands beyond the easy five-minutes-a-day minimum I impose upon myself. Most days, it’s much more than that, because once I get sucked in, I never want to start. I often yearn for a better eye, a stronger and more original sense of artistic vision in my work (like the brilliant creative vision I see manifested in the work of the sketchbook artists I admire on Instagram), and as I said I get plenty frustrated with my fumbling, my un-originality. But that’s all before and after the fact. DURING, when the pen is in my hand, all of that drops away and I experience the pure, absorbed joy of mark-making. That’s what keeps me at it, not a sense of progress (although when I look back, I can see that I have improved). A last thought. When I began taking online classes, I found that many instructors speak very strongly against sketching in pencil, on the grounds that it makes beginners too fussy, too prone to erase. I will say that while I understand that thinking (and do a fair amount of sketching directly in ink myself, because I’m addicted to pens), for me that advice was a misdirect. I spent about eighteen months obediently eschewing pencil before I had a light bulb moment of: oh wait, I love how pencil feels going on the page. And boom, just like that, things opened wide. I love pencil sketching and then putting ink over it. That suits me really well. Diminished a lot of my frustration over ‘ruining’ things because it takes me a few tries to get the shape right. And I just plain like the texture! It’s funny that with everything else in life (homeschooling, ahem) my entire approach is: take what works and do my own thing with it, but with drawing I was quite cowed by authority at first. I’ll close with some books Rilla and I have enjoyed working from, these past two years. When I’m stumped for material, I pull out one of them and tackle a page. 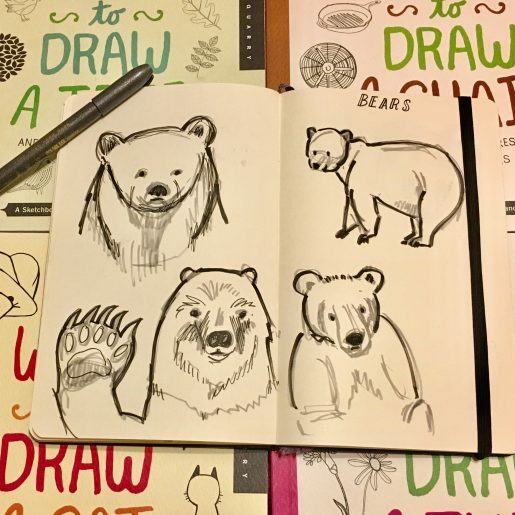 Rilla and I are looking forward to working through this book together: Draw Every Day, Draw Every Way (Guided Sketchbook): Sketch, Paint, and Doodle Through One Creative Year by Jennifer Orkin Lewis (AugustWren on Instagram—my fave!). This is one of those books you’re meant to and paint directly in, and I’m excited to think we’ll be creating a little archive for ourselves of our shared sketchbook journey. She’s been my staunch companion every step of the way, so far. Danny and Koosje and Roz are the superstars of Rilla’s world. 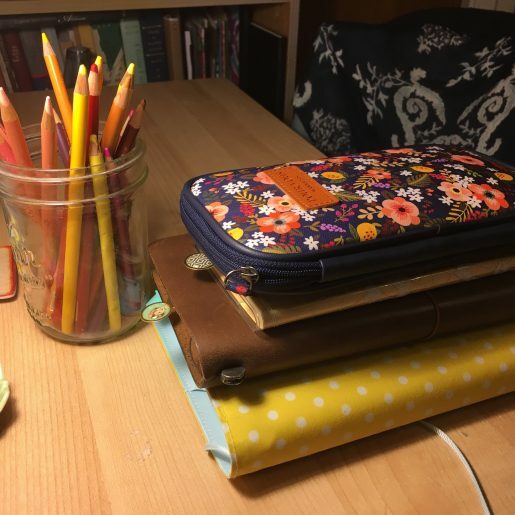 • Notebooks and sketchbooks and planners, oh my! I put this on Instagram and decided to carry it over here in case anyone needs stocking stuffer ideas. 😉 The Amazon links are affiliate but not the JetPens links and the rest. Everyday pen carry, deconstructed. Washi samples, a beloved Hokusai print I cut out of an old desk calendar, postage stamps, scissors. Hobonichi stencil, Galison notepad (last sheet, wah! ), and a Reset Girl “planner honey” clip. I think the washi samples were a freebie included with an order from Etsy seller Cute Things From Japan. Favorite drawing pens, left to right: Zebra brush pen, Kuretake brush pen in gray ink (my new love), Tombow blue body brush pen, hard tip (which I find myself reaching for more and more often—I like it better than the UniPin or Micron), Pentel Pocket Brush Pen (this one has been a total game-changer for me). Favorite writing pens: Lamy Safari (pink), medium nib, blue-black ink. Pilot Metropolitan fountain pens, both medium nibs, one gray ink (I forget which, from a Goulet gray sampler), one my dream ink, Pilot Iroshizuku Shin-Kai, a deep navy blue. All of these inks and pigments are dreamy in my Hobonichi Cousin and Weeks planners, my Midori Travelers Notebook (I favor their 002 grid inserts), and on the flecked, recycled papers of the impossibly lovely Wild Simplicity Daybook inserts. 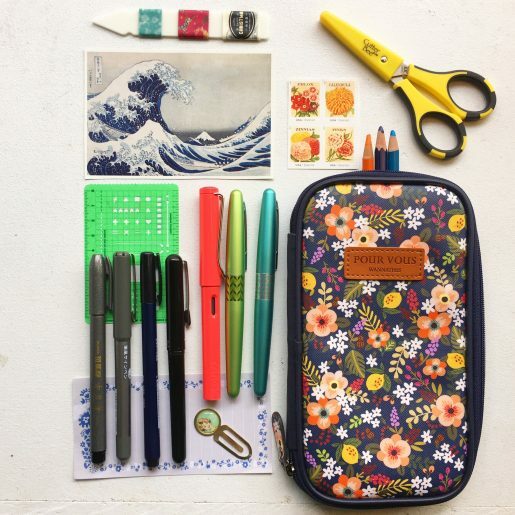 Floral pen case from MochiThings (I recommend watching for their sales because otherwise they’re pricey). I carry my tiny watercolor palette and waterbrushes in a separate pouch, but they fit in this case too if I leave a few pens home. 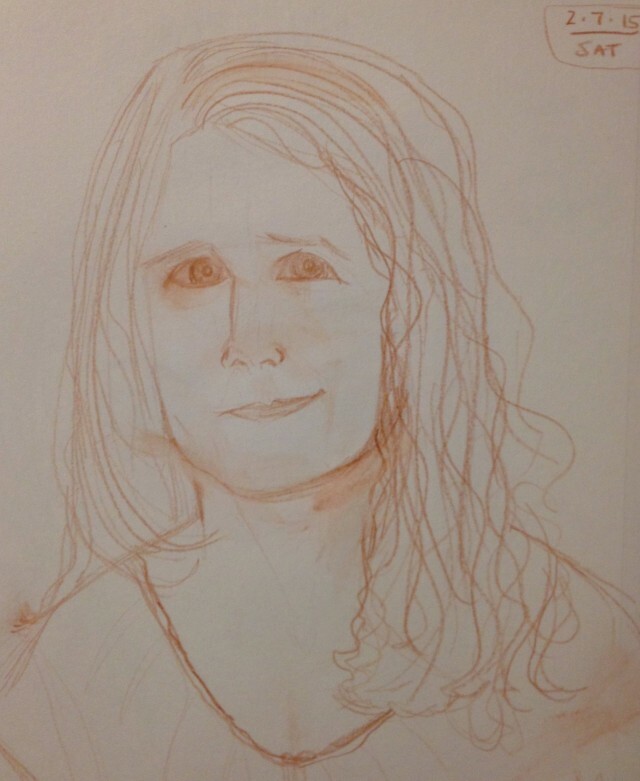 On Twitter, Kim asked if I had any advice for a family getting started with sketching and art journaling. Did I ever! I’ve Storified the conversation, if you’d like to see how it unfolded, but I’ll recap it here as well. My replies below, expanded a bit. Points #6 and 7 are the most important. 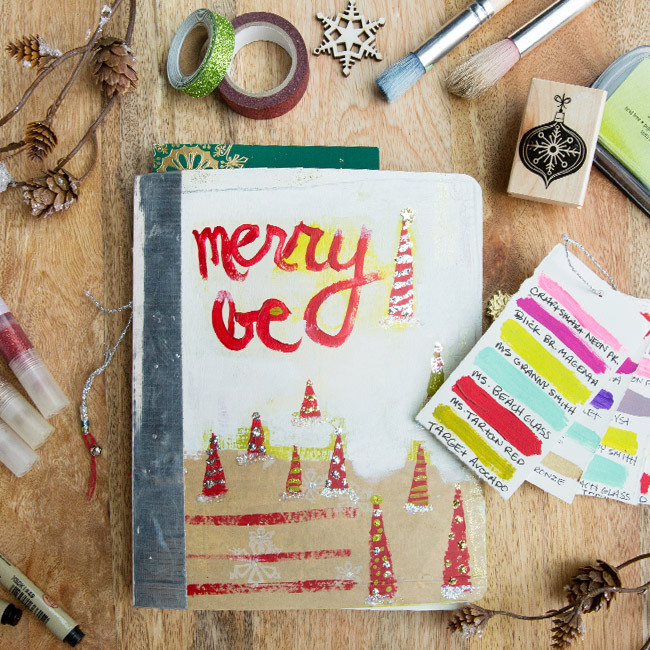 2) Sign up for a free two-week trial at Creativebug and take Dawn Devries Sokol’s Art Journaling class and Lisa Congdon’s Basic Line Drawing. I wrote about how much Lisa’s class inspired me in my “Learning in Public” post. 3) A bunch of books to inspire you: Lynda Barry’s wonderful Syllabus; Danny Gregory’s new Art Before Breakfast (it’s a delight; I’ll be reviewing it soon) and the much-beloved The Creative License; the Illustration School series; the “20 Ways to Draw a…” series; Claire Walker Leslie’s Keeping a Nature Journal; the Usborne “I Can Draw” series. And a few more recommendations in this older post. 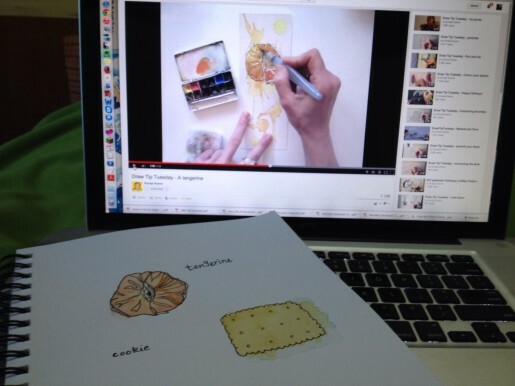 4) Maybe try a Sketchbook Skool course! They offer a free sample class (I mean klass) so you can get a taste of the magic. 5) Cathy Johnson videos. Rilla loves Cathy’s art and her gentle delivery. When I’m writing a novel, my most intense work happens while I look like I’m doing nothing at all. Sitting and staring blankly, chewing my nails, or filling an entire page with tiny lines and spirals. This is my body getting out of the way so my brain can get down to the real work of creating. And for the visual arts, these totally tactile pursuits, you’ve got to have a place to spread out your paints, your pencils, your small objects that make you itch to draw. You know what’s nice and tidy and doesn’t clutter a room? A cellphone. If you want them to spend less time staring at screens (I’m not knocking screens here, you know I love me some screen time), you’ve got to grant them some real estate. With that in mind, I make a point of keeping art supplies in easy reach. We have a dedicated kitchen drawer for placemats, paper, paint supplies so even the youngest kids can help themselves. 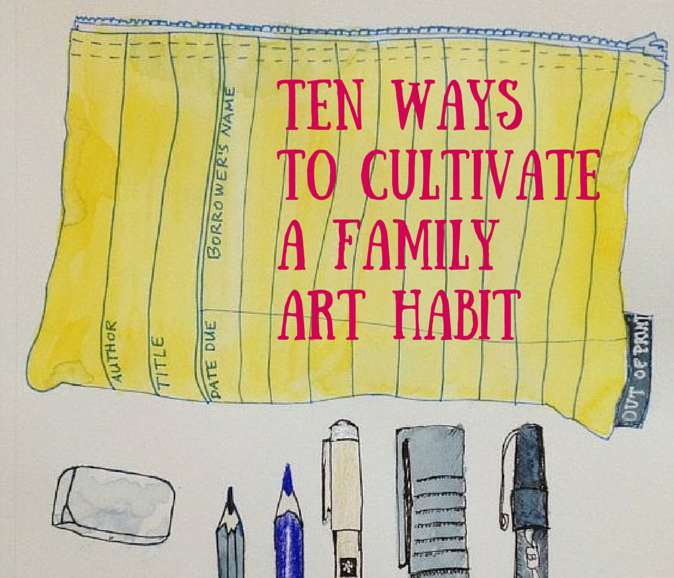 Jars of colored pencils & crayons on table, a sharpener on the kitchen counter, a stack of art books on the shelf nearby. I want them to have constant free access to art materials. It’s also a good idea to keep a bag packed for outings. I described ours in this old GeekMom post. When my older kids were little, I read lots and lots about the benefits of providing children with really high quality art supplies. In some cases, I still agree: Prismacolor colored pencils are worlds better than your drugstore variety. The lead is so creamy and blendable. They’re expensive but they last a long time—we’re on our second set of 72 colors in over ten years. But watercolors? Real watercolor paper makes a huge difference, but it’s expensive; that’s one reason I was so taken with Jenn’s idea to cut it into smaller, postcard-sized pieces. But when it comes to the paints themselves, well, I’ve been the high-quality route, absorbed the persuasive literature that talks about rich pigments and translucent hues; bought the pricey tubes of red, yellow, blue; collected jars for mixing colors; watched my children squeeze out too much paint and gleefully swirl it into an expensive puddle of mud-colored glop. Lesson learned. The 99 cent Roseart or Crayola sets work just fine. In fact, dare I say I think my preschoolers like them better? Mixing colors is fun, but there is nothing quite so appealing as that bright rainbow of pretty paint ovals all in a row. When Wonderboy and Rilla make a mess of their paints, Jane cleans them up with a rag and they’re practically good as new. We’re still addicted to Prismacolor pencils—no other brand will do for me. And I like Micron pens for line drawing. The ink is waterfast so you can paint over it (like my pumpkins in yesterday’s post). I also picked up a few gel pens—white, silver, and gold—and Rilla has had unbelievable amounts of fun with them. I love the white one for writing on a dark surface, like on the tag of my pencil pouch here. The sketchbook I just filled up was a Canson Mixed Media, 7×10 spiral bound. The size worked really well for me and the paper takes watercolor okay (not perfectly but well enough for where I am right now). I also have a small Moleskine journal with watercolor paper, but it feels so special I find myself hesitant to use it and reaching for the mixed media book instead. (I’ve just started a new one, same as the one I filled up.) That’s my real playground, the place I’m not afraid to (in the words of my personal hero, Ms. Frizzle) “Take chances and make mistakes!” But I’m getting braver every day and the lovely paper in that Moleskine is calling to me. Guys, I still feel so shy about posting my drawings! I mean, I have so many friends who make their livings as illustrators—heck, one of them even just won the Caldecott! (GO DAN! SO THRILLED!) Do you know how nerve-wracking it is to know pros are looking at your rookie work? Of course you do. Because what I’ve learned is everyone feels that way. Even my most brilliant artist friends look at some other person’s work and sigh wistfully, wishing they’d made that piece. I’ve seen it happen time and again. So bit by bit I’m getting brave enough to share my baby steps. 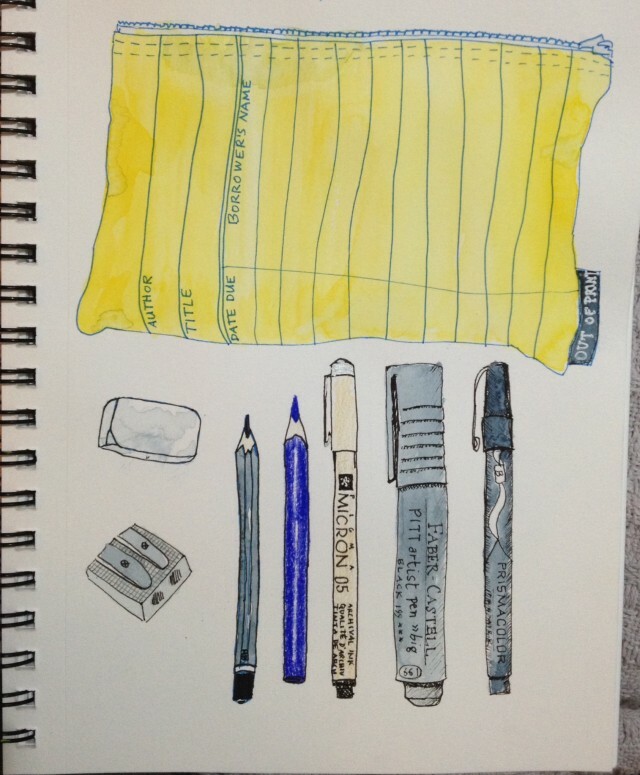 9) Okay, so you have your lovely sketchbook and drawing implements, now what to draw?? Well, I guarantee Koosje Koene’s videos mentioned above will keep you and the kids busy for a good long while. There’s also this wonderful Everyday Matters Challenge list at Danny Gregory’s blog. 328 suggestions, so you’re just about good through 2016. 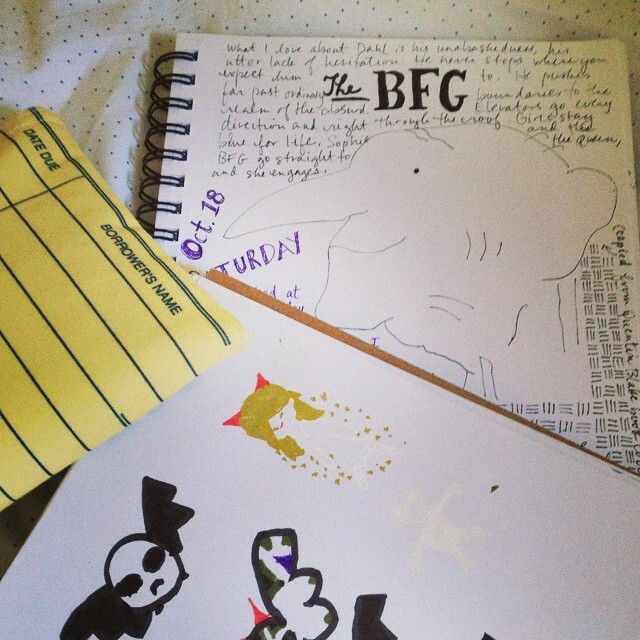 And Kortney tipped me off to this most excellent Lynda Barry post (in Rilla’s words, I simply adore her) about keeping a visual diary. 10) And a last tidbit I almost forgot: A most beloved activity here (especially for Rilla and me) is to listen to audiobooks while sketching. Many of my happiest hours have been spent this way. We’re especially fond of Roald Dahl while drawing. Nobody brings on the whimsy like Dahl. We’re using these 8×8″ recycled sketchbooks from Stubby Pencil Studio. We like the small, square shape and the sturdy cardboard covers (plain brown, easily decorated). I bought them to give the kids for Christmas and forgot about them. I remembered I’d also bought and forgotten these neato-bandito “Smencils“—#2 pencils with yummy scents like cinnamon, orange, and root beer—and when I dug the box out from under my bed where I’d hidden it, the sketchbooks were there too, a nice surprise. This is the same place I got the Crayon Rocks that so delighted Wonderboy on his birthday. 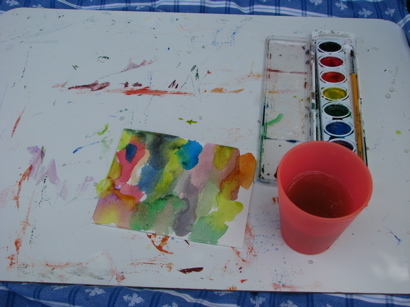 As for our outdoor painting supplies, the watercolors are just the cheap Crayola sets. Jane’s taking a watercolors class herself, and for that I was happy to buy nice quality paints. 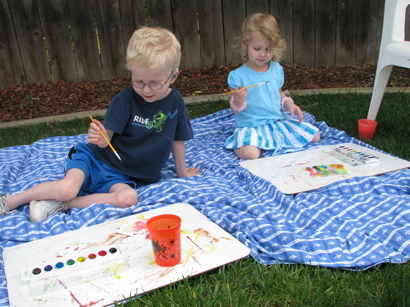 But for casual backyard painting for my other five kids? No more tubes. One last note—we really like to use painting boards under our paper. A long time ago I bought a box of dry-erase markerboards very cheap. They were scratch-and-dent discount items. I wish I could remember the website. Anyway, these make fabulous painting boards. They clean up easily, if you’re inclined to wipe them down. We usually aren’t.